The community of Makrinitsa in the central area of Pelion, is a preserved traditional village, with altitude from 850 m, and population 651 people. 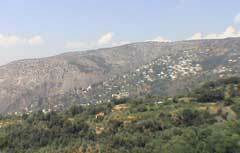 Makrinitsa consists of the village with its various neighborhoods, the surrounding area (20.000acres) and the forest (40.000 acres). The square, at the village�s entrance "BRANI", a place of extraordinary beauty . The main square with its "lion" fountain The beginning of the river "Krausidona" The stone-made bridges Makrinitsa is known as the "balcony of Pelion" for its unique view and its superb architectural character: Mansions ("Archontiko"), two towers, unique houses from the end of 17 century, roads covered by stones, bridges, churches of 17 and 18 century. Makrinitsa is located about 15km North of Volos, in an altitude of 850m. Its name came from a Monastery which was built around 1215, The village was built around the Monastery, from 1204. Makrinitsa and generally Pelion, followed Greece�s destiny and remained under Turkish rule until 1881, where the area of Thessalia was given to Greece. After 1863, Makrinitsa developed the culture and the arts, including schools for handicrafts. In the beginning of this century, Makrinitsa had 800 mules and horses for transportation. Makrinitsa became famous for its good builders (of houses and roofs) and its leather manufacturing. The latter gave the chance to people of Makrinitsa to develop the trade with all over Greece. Makrinitsa remains a big village with exceptional beauty and one of the most touristic villages of Pelion. It is worth it to pay a visit and admire its view, its beautiful old houses ("archontika"), its traditional stone-covered streets, and its byzantine churches. Since 1991 and every summer, from July 15 until September 30, a lot of cultural events are taking place in the community. These events are called "MAKRINITSA" (followed by the current year). These events include performances concerts exhibitions dances Many theatrical and historical performances are presented in the community of Makrinitsa. In the concerts you can hear basically traditional greek music and songs. The major cultural event is the presentation of the traditional custom of "May". Exhibitions of paintings are among the most common events taking place every summer in Makrinitsa. Traditional and folkloric music and dances are popular events every summer.